The residential property market in the province of BC continued its downwards momentum in August. Following fewer sales and rising inventory, there appears to be little sign of resurrecting a market bogged down by tighter lending conditions and a swath of government tax policies. Home sales in the province dropped 26% year-over-year in the month of August. There were just 6748 sales in BC, a six year low for the month. The slowdown was rather daunting in the Fraser Valley where sales slid an eye watering 39.5% in August. Greater Vancouver sales fell 37%, Victoria by 21%, and the Okanagan-Mainline by 20%. Regardless of how you slice it, the trend was rather ominous. 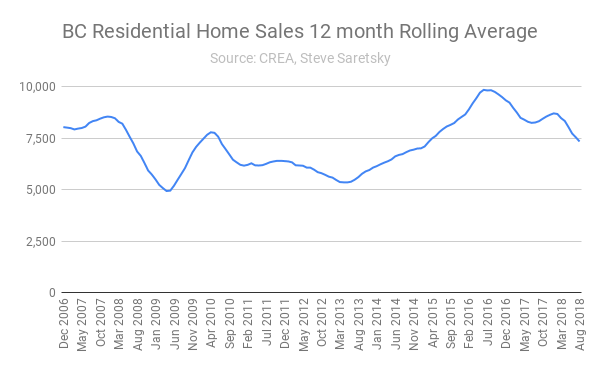 BC home sales using a 12 month rolling average. Buyer sentiment disagrees. BC home buyers spent 27% less on residential real estate this August. Mortgage credit continues to contract, while simultaneously foreign buyers have lost their appetite for real estate, reducing their spending by 49% this summer. 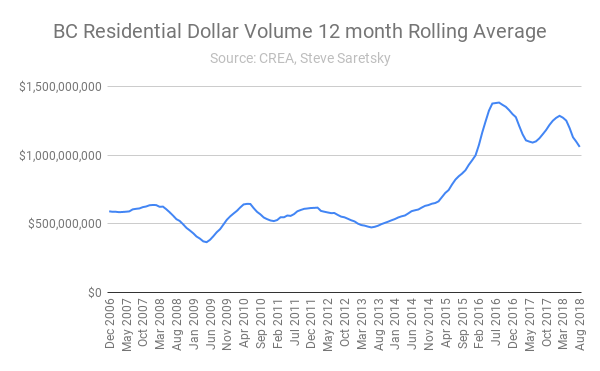 BC residential dollar volumes- 12 month rolling average. With peak sales in the rearview, and inventory finally on the rise, up 19.6% from August 2017, it appears further headwinds are a certainty for BC’s housing market. 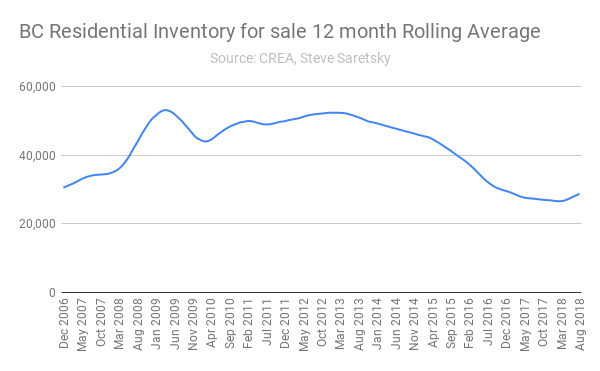 BC residential inventory- 12 month rolling average.